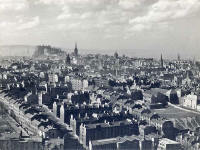 Looking down on Dumbiedykes and out towards Edinburgh Castle from Salisbury Crags - probably around the 1950s. I have added a key to the photograph above. 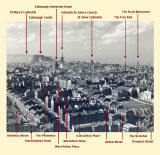 Thank you to Bob Henderson, Edinburgh for providing additional details. and the slope down to Prospect Street at its bottom." 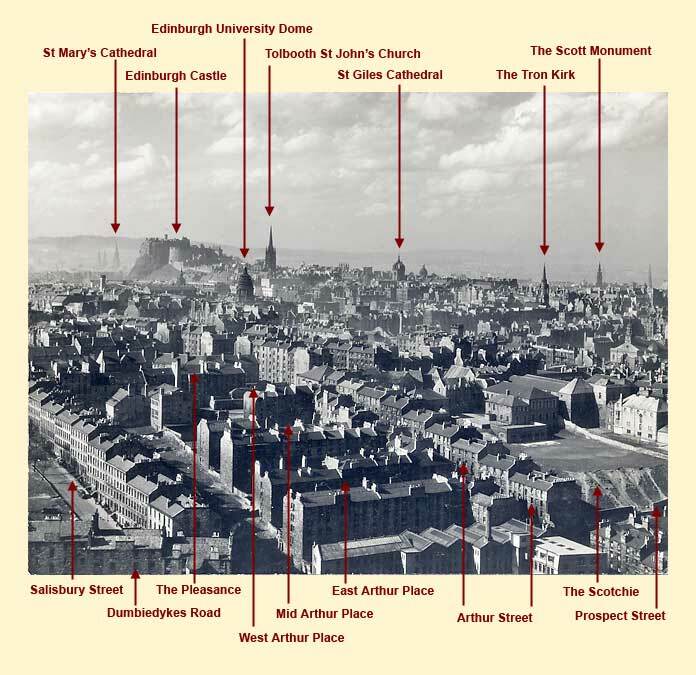 - Cowans, then the two rows of tenements of East Arthur Place. 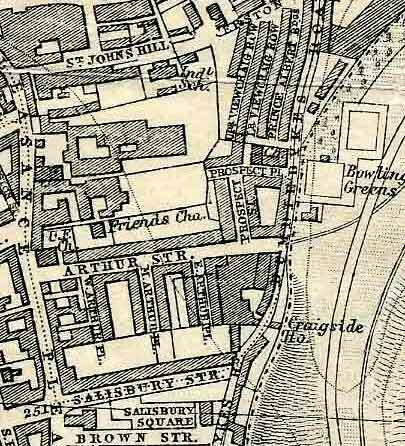 - then two rows of Middle Arthur Place, then the single half row of West Arthur Place with the rear of Young Brothers Bakers on the left . I can even see the window of the place I called home until about 2 years before this shot was taken. "I opened my mailbox and they say it is 4 weeks to Christmas. Well, my Christmas has come just now. What a great photo." "I have walked all over it the Scotchie, up and down the brae (ha ha ha). On Sundays, all the men would play a great game of football on the Scotchie. There is a wall beside the Scotchie, far right. I remember I cut my knee on that wall. When you go over the wall into the brewery and walk for about 2 minutes, there is another wall (not in shot) which separate my school St Patrick's in St Johns Hill from the brewery. The Scotchie used to be a small tranquil park until they knocked down the houses on the west side of Prospect Street. I don't know how 'The Scotchie' got its name." "You can see my Nan's window and my Aunt's window, too, in the photo; also Cowan's paper factory." "St Patrick's Chapel in the Cowgate where we all used to go is the building with the dome on the far-right of the photo. Next door to it, masked out by another building, is St Ann's School that I used to go to." "I noticed that all the lums (chimneys) had no smoke, so the photo was probably taking during a hot summers day. I can well remember the smoke coming from the lums in the winter. "The building was Baxendales, the cardboard box makers' factory. But see UPDATE below. As children, during and just after the war, we used to look in at the ground floor windows, which were always open, amazed by the roaring clanking monsters that were the box making machines." Eric Gold wrote: "I knew it as Cowan's paper factory." Norman Forsyth wrote: "It was Cowan's envelope works." "Of course, everyone else is right. It was Cowan's. I knew that fine. I just got a little confused!" "The Scotchie was not the hill you see but the flat area on top where the older boys and young men used to play football." "THE HOMES FIT FOR HEROES"
"Bob Henderson mentioned the paper factory at the bottom of Arthur street. He called it Baxendales but I knew it as Cowan's paper factory. I had a grandmother who worked there many other relatives and they called it Cowan's. Maybe Bob is right and Baxendales sold it to Cowan's but that would be many years before Jean and I set foot on this planet. I will ask my sister about it when she comes home from her holiday. As far as I knew it the Scotchie was the whole area, not just the flat top. I also remember the men playing football, I can still remember the men including my older brothers playing football as if it were today.
" I, too, played at the Scotchie and ruined many a pair of jeans, bought from Ellen's Drapery in the High St, climbing up and sliding down the slopes with my palls. It was funny to see the marks left on the hillside by the many footsteps and backsides that used it." Norman Forsyth was brought up in Dumbiedykes and lived the top flat at 9 Prospect Street. He left there in 1932 at the age of 14. "It's a long time to cast my mind back io those early days, but what wonderful memories they evoke seeing these pictures and comments. I spent many an hour in the "Scotchie", having to climb two walls first (nearly 10 feet in all) to have a game of football under cover in an area beneath a building called the New College Settlement." "In answer to the query about the building with the skylights beyond the end of Prospect Street, it was Cowan's envelope works."